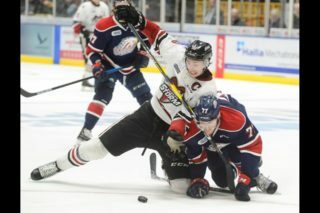 LONDON – Down 3-0 in the series, the Guelph Storm won four straight versus the top ranked London Knights to advance to the Western Conference Semifinals where they’ll face the Saginaw Spirit. 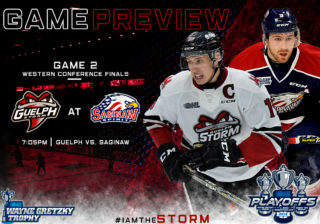 It will be a quick turnaround for Guelph as they’ll travel to Saginaw for Game 1 in less than 48 hours. 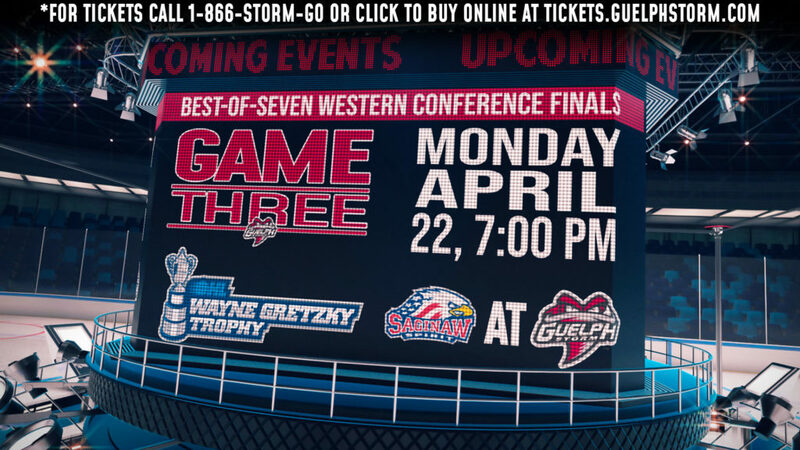 Tickets for Game 3 in Guelph on Monday, April 22nd at 7 pm, Game 4 in Guelph on Wednesday, April 24th at 7 pm, or Game 6 in Guelph (if necessary) on Sunday, April 28th at 2 pm ARE NOW ON SALE AT TICKETS.GUELPHSTORM.COM. CLICK HERE TO BUY TICKETS FOR ALL THREE POSSIBLE HOME GAMES IN GUELPH. On Tuesday night at the Budweiser Gardens, Guelph led 1-0 after the first on a Dmitri Samorukov marker. The Knights answered back at the start of the second as they built a 3-1 lead before the stanza was 4 minutes old. Down a pair, Nick Suzuki cut the lead to one with his 10th of the series on the powerplay. In the third period, London had some early chances to restore their three goal advantage, but couldn’t solve Anthony Popovich. 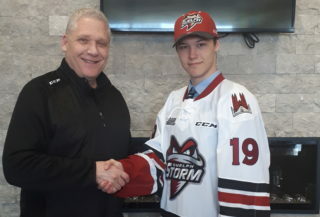 Storm captain Isaac Ratcliffe snapped home the equalizer off a Suzuki faceoff win and then potted the eventual winner on a beautiful pass by Sean Durzi. Mackenzie Entwistle added an insurance marker to make it three Storm goals in under four minutes and then Entwistle put the game out of reach into the empty net with 4:22 remaining in the contest. 1st Period-1, Guelph, Samorukov 4 16:40. Penalties-Moskal Ldn (cross checking), 1:11. 2nd Period-2, London, Formenton 4 (Bouchard, Regula), 0:33 (PP). 3, London, McMichael 2 (Formenton, Coome), 2:23. 4, London, Foudy 6 (Lochead), 3:37. 5, Guelph, Suzuki 10 (Durzi, Samorukov), 6:59 (PP). Penalties-Schnarr Gue (hooking), 0:15; Hancock Ldn (tripping), 6:02; Ralph Gue (hooking), 12:10; Suzuki Gue (hooking), 18:24. 3rd Period-6, Guelph, Ratcliffe 4 (Suzuki), 2:49. 7, Guelph, Ratcliffe 5 (Durzi), 3:59. 8, Guelph, Entwistle 4 (Ratcliffe, Durzi), 6:30. 9, Guelph, Entwistle 5 (Suzuki), 15:38 (EN). Penalties-Commisso Gue (roughing), 15:13; Formenton Ldn (roughing), 15:13; Keane Ldn (slashing), 18:07. Shots on Goal-Guelph 6-10-11-27. London 10-15-9-34. Power Play Opportunities-Guelph 1 / 3; London 1 / 3. Goalies-Guelph, Popovich (34 shots-31 saves). London, Kooy (26 shots-21 saves). Referees-Mike Hamilton (8), Scott Ferguson (35). Linesmen-Jean-Francois Menard (52), Dustin McCrank (68).